Philosophy is scheduled for an election next week, October 1st.In connection with that, we will be holding a Q&A with the candidates. This will be an opportunity for members of the community to pose questions to the candidates on the topic of moderation. Participation is completely voluntary. As we had done last year, we will be doing the question collection one week prior to the start of the actual nomination phase. Until the nomination phase, (so, until Monday, October 1st at 20:00:00Z UTC, or 4:00 pm EDT on the same day, give or take time to arrive for closure), this question will be open to collect potential questions from the users of the site. Post answers to this question containing any questions you would like to ask the candidates. Please only post one question per answer. If your question contains a link, please use the syntax of [text](link), as that will make it easier for transcribing for the finished questionnaire. This is a perfect opportunity to voice questions that are specific to your community and issues that you are running into at currently. At the start of the nomination phase, the Community Team will select up to 8 of the top voted questions submitted by the community provided in this thread, to use in addition to the aforementioned 2 guaranteed questions. Once questions have been selected, a new question will be opened to host the actual questionnaire for the candidates, typically containing 10 questions in total. How would you delimitate "philosophy" as the subject matter of this site? Is every more or less "deep" thought philosophy or are qualifications in content and/or style necessary in order to make this site work as intended? If so, what would you deem essential? How often do you visit the site, and what do you do when you do visit - reviewing, answering questions, asking questions, commenting? Which of these do you think you can contribute the most at? What problems do you see with the principle mechanisms of a Q&A format like StackExchange aspiring to create a database of knowledge when it comes to philosophy? How would you take them into consideration when moderating? How will you go about navigating the fine line between acceptable and unacceptable when it comes to posts reflecting fringe or politically incorrect positions? Please be concrete: what actual steps would you take, if any? Consider seeing a question that is too vague, too general or too subjective to answer. Would you flag to close the question immediately, or would you try to help the user revise the question? If you would help the user, how would you go about doing that? Would you edit yourself, would you give advice to the user, etc. Would you act differently if it were a new user/contributer? Please elaborate. Suppose a comment is flagged as "unfriendly or unkind". 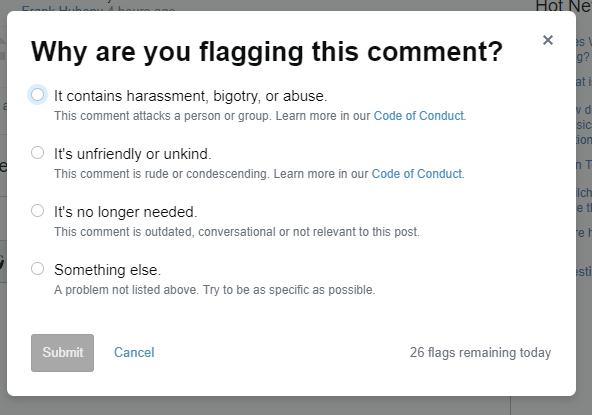 How would you handle something like that as distinct from a flag for "harassment, bigotry, or abuse"? My question is about the second item: "It's unfriendly or unkind." What do you think is the use of the chat rooms (or, what is your use of the chat), in relation to our Q&A format and our community? Do yoh use it just to "move discussions to chat" rather than long conversations in comments, or do you see it as a well to expand our way of communication further than Q&A style? Do you visit the chat frequently? Extra - do you think the community's use of the chat rooms could be utilized better than today? Elaborate. What will be your standards (if at all) for questions and answers in this site? Please elaborate as much as you can (syntax, grammar, included examples, references, etc). Extra - and what will you do with a post that doesn't follow these standards? Question for the candidates: What value do you see in making down-votes? This site is for discussion about Philosophy Stack Exchange. You must have an account there to participate. Philosophy Topic of the Week: Plato!